The ODOROX® Oasis™ unit is engineered to provide full home coverage by placing in a location such as basement or top floor to provide bacterial, viral, mold, mildew and VOC elimination throughout. The ODOROX® OasisTM unit is the right choice for residential applications. The OasisTM unit is designed so that it can be permanently installed to an HVAC System. 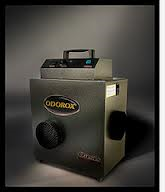 The ODOROX® OasisTM unit is finely tuned to treat residential odors as well as bacterial, viral and mold contamination. It is equipped with one ODOROX® hydroxyl generating optic and a washable filter. It has a built-in fan that is adjustable from approximately 250 to 500 cfm, and it operates using only 1.4 Amps. It is an ideal unit to continuously neutralize musty smells, cooking odors, light cigarette smoke, pet odors and decontaminate biological pathogens as it can operate 24 hours a day, 7 days a week. It is excellent for the chemically sensitive or medically compromised individuals.